What the world expects and what God has given to preach- ers to preach are at odds. The art of preaching involves, in part, a fundamental understanding of the distinction between the world governed by its prince, the devil, and the church, whose head is Christ. Yet there is tension. Why? Because preachers live in the world. That is how God set up the preaching office. God truly blessed the editors of LOGIA with a plethora of fine articles for this issue—more than we could fit within the covers. No doubt, we ought not be too surprised. As Luther so wonderfully put it, crux sola est nostra theologia. The cross is indeed never far from Jesus’ Christians—his cross and theirs. It brings us great joy, therefore, to publish an insightful and perspicuous assortment of studies on various aspects of the theology of the cross, suffering, and martyrdom. Gregory Schulz and Jeffery Warner both wrestle with suffering in the life of the Christian. Schulz tackles suffering and pain in general and provides counsel and comfort for the afflicted and those who minister to them by laying the groundwork for a theology of lament. Warner’s work will surely capture the attention of parish pastors and any who serve the dying, as he sets aside the euphemisms and unbiblical assumptions that so often cloud our view of death and the dying and centers hospital ministry where all theology must find its center: in the cross of Christ and the promises of God. Three articles shed light upon attitudes toward and teaching about the cross, martyrdom, and suffering from different ages in the history of the church militant. James Bushur sets forth in a highly accessible manner the theology of counsel and wisdom of Ignatius of Antioch in his Letter to the Romans. C. Matthew Phillips distills and elucidates Luther’s theology of suffering and martyrdom while providing a roadmap for those who wish to study the matter further through his careful source work. Finally, Matthew Heise uses the open archives of the former Soviet Union to uncover an account of the life and martyrdom of two faithful Lutheran pastors and the challenges that faced the Lutheran Church of the Soviet Union. These martyrs take their place with all martyrs as an encouragement for those who labor in the Lord’s vineyard, particularly those who are threatened by harm of any sort. Adam Koontz rounds out our exploration of suffering and the cross with an exegetical study. Examining apostolic suffering in 2 Corinthians, he brings to light key elements of Paul’s theology of the cross and demonstrates the letter’s lasting relevance for Christians enduring suffering in our own day. Lastly, Scott Murray broadens the scope of the issue a bit with a fruitful, timely, and discerning overview of Lutheran Orthodoxy and Pietism. He rightly notes that Pietism is not simply a movement resting securely in the past, but remains a very real and active force within the Lutheran Church—one that neither the Lutheran pastor nor layperson does well to overlook or underestimate. Murray does more than sound a warning, however. He offers valuable instruction on how to avoid the pitfalls of a dead orthodoxy (without the unfortunate caricatures that too often attend such a discussion) or an enthusiastic piety. The editors of LOGIA are pleased to bring these articles to print. It is our prayer that they focus your eyes upon the cross of Christ, buoy weak knees for episodes of suffering and cross-bearing, and deepen our readers’ understanding of a truly biblical, Lutheran theology of the cross. To order your own copy, click here. You can also subscribe to LOGIA here for print, and here for electronic. As seen in our current journal, Eastertide 2014, Holy Baptism, here is the entire review essay, The Reform of Baptism and Confirmation in American Lutheranism, by Dr. Armand Boehme. Baptism is not simply a once-and-done event of the past, much less a symbolic ritual act on the part of man for Martin Luther, and for Lutherans holding to the catechism. Bibliography to Stephen Pietsch’s “Sure Comfort: Luther on Depression,” LOGIA, 23:1. Black Dog Institute. Beyond Blue: the National Depression Initiative, www.beyondblue.org.au/. Blazer, Dan G. The Age of Melancholy, Major Depression and its Social Origins. New York: Routledge, 2005. Brecht, Martin. Martin Luther, His Road to Reformation 1483-1521. James L. Schaaf, translator. Minneapolis: Fortress, 1981. Brecht, Martin., Martin Luther, Shaping and Defining the Reformation 1521–1532. James L. Schaaf, translator. Minneapolis: Fortress, 1990. Clebsch, William A. and Charles R Jaekle. Pastoral Care in Historical Perspective. Northvale, NJ: Rowman & Littlefield, 1983. Foutz, Scott. “On the Life and Mystical Theology of Jean Gerson (1363-1429).” http://www.foutz.net/writings/foutz-gerson.html. Gowland, Angus. “The Problem of Early Modern Melancholy.” Past & Present. No.191 (May 2006): 77–120. Gritsch, Eric W. Martin, God’s Court Jester. Philadelphia: Fortress, 1980. Haile, H.G. Luther, A Biography. London: Sheldon, 1980. Headley, Tony. “Luther on Depression.” Light and Life (July-August) 1999. Hollon, Steven D. and Sona Dimidjian. “Cognative and Behavioral Treatment of Depression.” The Handbook of Depression. Second edition. Ian H. Gotlib and Consyance L. Hammen, editors. London, Guildford Press, 2009: 586–603. Hummel, Leonard M. “Heinz Kohut and Empathy: A Perspective from a Theology of the Cross.” Word & World. Volume XXI, No.1 (Winter 2001): 64–74. Hunter, R. Lanny and Victor L. Hunter. What Your Doctor and Your Pastor Want You to Know about Depression. St Louis: Chalice Press, 2004. Jackson, Stanley. Melancholia and Depression: From Hippocratic Times to Modern Times. Yale University Press, 1990. Kleinig, John W. Grace Upon Grace, Spirituality for Today. St. Louis: Concordia Publishing House, 2008. Luthers Werke im WWW Weimarer Ausgabe. http://luther.chadwyck.co.uk/. Luther’s Works (American Edition). 55 vols. Jaroslav Pelikan and Helmut T. Lehman, editors. St Louis: Concordia Publishing House; Philadelphia: Muhlenburg Press, 1960–1975. Martin Luthers Werke: Kritische Gesamtausgabe. Briefwechsel. 18 vols. Weimar: Hermann Böhlau, 1930–1985. Martin Luthers Werke: Kritische Gesamtausgabe. Tischreden. 6 vols. Weimar: Hermann Böhlau, 1930–1985. Midelfort, H.C. Erik. A History of Madness in Sixteenth Century Germany. Stanford University Press: 2000. Oberman, Heiko A. Luther, Man between God and the Devil. Eileen Walliser-Schwarzbart, translator. New York: Yale University Press, 1989. ———. “Teufelsdreck: Eschatology and Scatology in the ‘Old Luther.’” Sixteenth Century Journal. Vol. 20, No.3 (1988). http://dlibrary.acu.edu.au/research/theology/ejournal/aejt_8/luther.htm. Palmer, Parker J. “All The Way Down: Depression and the Spiritual Journey.” Weavings: A Journal of Christian Spiritual Life. Vol. 13, No. 5 (September-October 1998). Pietsch, Stephen. “Depression and the Soul, A Cooks Tour.” Australian Lutheran College opening lecture, 2009. http://www.alc.edu.au/assets/education/about/academic-publications/opening-lecture/2010-depression-and-the-soul.pdf. ———. “Seelsorge—A Living Tradition in Pastoral Theology Practice.” Lutheran Theological Journal. Vol. 43, No.1 (May 2009): 49–62. Posen, M., D.C. Clark, M. Harrow, J. Fawcett. “Guilt and conscience in major depressive disorders.” The American Journal of Psychiatry, 1983. Vol. 140: 839–844. Radden, Jennifer. Moody Minds Distempered, Essays on Melancholy and Depression. Oxford University Press, 2009. ———. The Nature of Melancholy, From Aristotle to Kristeva. Oxford University Press, 2000. Rowe, Dorothy. “Depression's punitive conscience: Robert Enke's tragic death stemmed from a need to self-punish familiar to anyone who's suffered depression.” The Guardian. November 12, 2009. http://www.guardian.co.uk/commentisfree/2009/nov/12/robert-enke-depression-suicide. Stolt, Birgit. Die Sprachmischung in Luthers Tischreden: Studien zum Problem der Zweisprachigkeit. Uppsala: Almqvist and Wiksell, 1964. Stone, Howard W. Depression and Hope, New Insights for Pastoral Counseling. Minneapolis: Augsburg-Fortress, 1998. Swinton, John. Spirituality and Mental Health Care, Discovering a “Forgotten” Dimension. London: Jessica Kingsley Publishing, 2006. Thompson, Mark D., “Luther on Despair.” The Consolations of Theology. Brian S. Rosner, editor. Grand Rapids: Eerdmanns, 2008. Todd, M. John. Luther, A Life. New York: Crossroad, 1982. Trader, Alexis. Ancient Christian Wisdom and Aaron Beck’s Cognitive Therapy: A Meeting of Minds. New York: Peter Lang, 2011. Wengert, Timothy, editor. 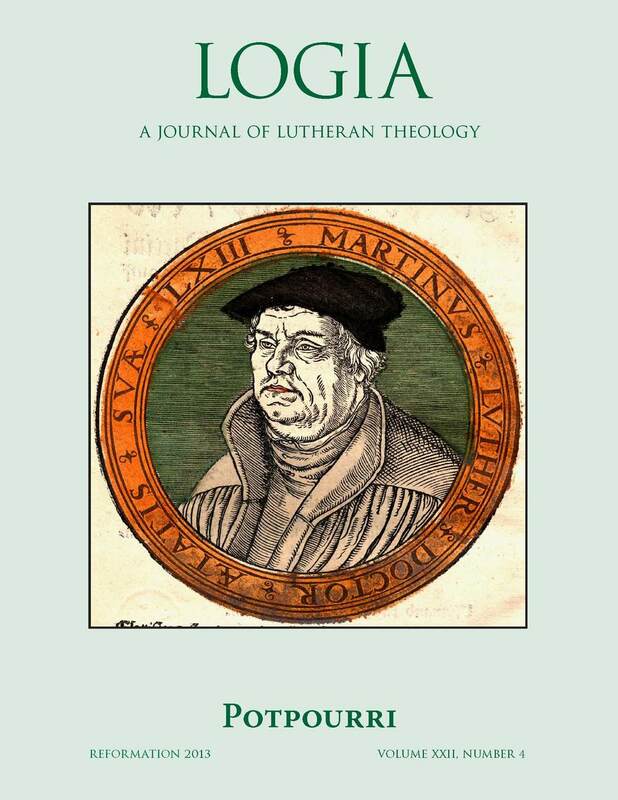 The Pastoral Luther, Essays on Martin Luther’s Practical Theology. Grand Rapids: Eerdmanns, 2009. Wilson, Eric G. Against Happiness—In Praise of Melancholy. Farrar: Straus and Giroux, 2008. Yahnke, Beverly K. “Prescriptions for the Soul: The Taxonomy of Despair.” Doxology Website: http://www.doxology.us/downloads/35_yahnke2.pdf. Von Loewenich, Walther. Luther’s Theology of the Cross. Minneapolis: Fortress, 1976. It will be necessary to bear in mind that the following survey will be somewhat selective. Many of the rifts among Lutherans in Australia were of minor significance, the details of which are fully treated and documented in the histories produced by authors in the past. The major divisions and sticking points on the path to unity in congregations, synods, and churches in Australian Lutheranism will receive more concentrated attention. If we look at Lutheran disunity in Australia there were serious issues which, though insignificant in themselves, could not be solved for many years, leaving painful scars on the life of these churches. Before we explore the Australian Lutheran scene more fully, it may also be useful to remind ourselves that as long as the church of Christ has existed on this earth there have often been deep-seated problems leading to schisms and heresies. For example, the New Testament does not cover up the painful difficulties facing the Apostle Paul in his Corinthian church, where there were Pauline, Petrine, and Apollonic factions and even a Christ fellowship developing and threatening harmony. A study of church history reveals a continuing story of the dissensions that often developed to the detriment of the church at large. Sometimes these divisions were necessary and justified. From a Lutheran perspective the churches of the sixteenth-century Reformation were not spared their share of deformation and division. A number of significant parallels exist between the garden of Eden and the tabernacle. The contour, substance, and meaning of the garden inform the tabernacle and its service. The reverse also is true; understanding the tabernacle helps one conceptualize the garden. The biblical texts provide a discourse between the two "sanctuaries." This essay argues that the Lutheran tradition offers a sacramental approach to the theology of the Holy Spirit that shapes its view of the sanctified life. The term sacramental is used in the broad sense to speak of the Spirit’s work in salvation history through means in creation — fundamentally, through the Son’s own human life and history. Because such a pneumatology is grounded in the identity of the incarnate Christ as the privileged locus of the Holy Spirit, as the bearer and giver of the Spirit of God, we may refer to this sacramental view of the Spirit as an incarnational pneumatology. The term sacramental is also used in the narrow sense in this essay to refer to God’s work through his instituted means of grace, namely, baptism and the Lord’s Supper.1 The Holy Spirit works through ordinary means or signs in creation (that is, water, bread, and wine) not only to deliver God’s word of forgiveness, life, and salvation to us now but also to shape our lives after Christ’s own life in the Spirit. If the forgiveness that God delivers through his means of grace points us to the benefit of the sacrament, the life in the Spirit of Christ that flows from receiving such gifts of salvation refers us to the daily use of the sacrament. Our argument proceeds in three stages. First, we show that a Nicene approach to the doctrine of the Holy Spirit, while interested in drawing the Third Person’s ontological distinction from us, ultimately points to his sanctifying works on our behalf as the basis for acknowledging and confessing his divine equality with the Father and the Son. In a creedal hermeneutic, an important shift is made from the immateriality to the materiality of the Spirit, from ontology to soteriology, which sets the stage for conceiving the Spirit’s work through means in creation to bring about God’s saving purposes. Second, we argue that a material or incarnational view of the Holy Spirit finds its basis in the affirmation of the Spirit’s inseparable connection to Christ’s own flesh, the incarnate Word’s life and mission. Pneumatology does not only look for the Spirit who comes after Christ, but sees the Spirit already in Christ. In a prominent patristic reading of the Jordan event, Christ’s receiving of the Spirit for us in baptism paves the way in the Father’s plan of salvation for Christ’s giving of the Spirit to us in our baptism.2 There is a chain of salvation, a pneumatological link, between Christology and ecclesiology. We see that a sacramental pneumatology is finally grounded in a pneumatological Christology. In Lutheran theology, Luther’s affirmation of the Holy Spirit’s work through the external word is not merely a polemic move against enthusiasts but is an approach to pneumatology that assumes the Spirit’s inseparable connection to Christ and his words of life. Editor's Note: As an extra for the Eastertide 2013 issue of LOGIA, we are posting this book review from the Eastertide 1997 edition of LOGIA. If you'd like to purchase a copy of all the back issues of LOGIA, please click here. Die Erlanger Theologie (no. 67 in Einzelarbeiten aus der Kirchengeschichte Bayerns). By Karlmann Beyschlag. Erlangen: Martin-Luther-Verlag with the Verein für bayerische Kirchengeschichte, 1993. 295 pages. Since the nineteenth century, the theological faculty at the University of Erlangen has been the citadel of confessional Lutheranism. In the 1940s and 1950s, students from America and other foreign countries streamed to Erlangen, attracted by the world theological leadership of its university. But after the deaths of Elert and Althaus, a reaction set in the theological faculty as well as in the Lutheran churches of Germany. The teachings of Karl Barth, the Barmen Declaration, and the “Confessing Church” began to suppress confessional Lutheranism. Principles of the Union Church, including intercommunion and open communion (Leuenberg Concord), were accepted by the Lutheran churches. A much less talented group of theologians replaced the great ones at Erlangen. Several of these sought notoriety by denouncing Elert and Althaus. In 1971, they succeeded in having the traditional subscription of the Lutheran Book of Concord abolished at Erlangen. Since then, Erlangen has been the launching pad for attacks upon the Lutheran Church and its symbolic books. The special target of their assaults has been the Lutheran distinction of law and gospel and the doctrine of the two realms. The significance of this new book is that Karlmann Beyschlag, a pupil of Elert and Althaus, has written both a brilliant historical work and a strong defense against many falsehoods that have been leveled against these stalwart Lutherans. The author begins by delineating the background of Erlangen theology, stemming from the Awakening Movement of the nineteenth century. Important impulses came from Christian Krafft, Carl von Raumer, and the earlier thinker Johann Georg Hamann. He then gives sketches of the most important theologians at Erlangen. First is Adolf von Harleß (1806–79), who was both an important scholar and a powerful church leader. As theologian he was the founder of Erlangen theology and one of its most important writers; as churchman and friend of Löhe he was able to separate the Lutheran and Reformed parts of the Protestant state church and to create a confessional Lutheran church in Bavaria (33–57). Next, Beyschlag discusses the greatest Erlangen theologian of the nineteenth century, Johann Christian Konrad von Hofmann (1810–77), giving a brilliant presentation of his complicated thought. Hofmann made a deep impression upon several Americans, including the Dubuque theologian Johann Michael Reu. Within the scope of this theology came the “Erlangen School,” a movement that built upon the theologian’s personal experience of salvation and emphasized the Lutheran Confessions. Beginning with Harleß and explicated through Höfling, Hofmann, Thomasius, Delitzsch, Theodosius Harnack, von Zezschwitz, Schmid, and Frank, the movement spread from Erlangen to the universities of Leipzig, Rostock, Greifswald, and Dorpat. The “Erlangen School” as a specific theological movement ended with the death of Frank in 1894, but another important theological program was to appear at Erlangen in the twentieth century, building upon the earlier movement. In a separate chapter, Beyschlag characterizes a group of church historians at the university who did not really belong to the “Erlangen School” movement, especially Theodor Zahn, Albert Hauck, and Reinhold Seeberg. He then discusses three other important historians: Gustav Plitt, Theodore Kolde, and Karl Schornbaum. In chapter 7 he presents “the second blossoming of Erlangen theology” (143–203). This movement began with the criticism of the old “Erlangen School” by a pupil of Frank, Ludwig Ihmels. Without rejecting the importance of the religious certainty of the theologian, Ihmels warned that not human experience but divine revelation must be the true basis of a sound theology (143–145). Beyschlag names three great men in the rebirth of Erlangen theology: Otto Procksch, Werner Elert, and Paul Althaus. The Old Testament scholar Procksch, who was a very strong teacher as well as writer, renewed Hofmann’s conception of Heilsgeschichte. Unfortunately, Procksch’s important theology of the Old Testament was not published until after his death (1950), so that it was already superseded by the fine work of his pupil Walter Eichrodt (148). Procksch is remembered equally for his firm confessional Lutheranism and for his determined stand against the Nazi movement. Beyschlag ranks Elert and Hofmann as the two most important Erlangen scholars in the past two centuries. He describes Elert as “the totally unclerical man who, in his outward appearance, looked more like a general in civilian clothing than a theologian” (151). Elert, “like all intellectual giants,” was “an uncommonly complicated character, who was just as easily offended as he was polemically feared” (151–152). He cites the remark of Trillhaas: “Elert had not a single friend with whom he had not at least once had a sturdy fight” (151). Elert’s early writings were historical and systematic, and were largely devoted to Luther, Melanchthon, the Lutheran Confessions, and subsequent developments in the history of theology. In some way or other, the distinction of law and gospel took an important place in all these writings. ((A balanced evaluation of Elert appears in the new monograph by the Icelander Sigurjon Arni Eyjolfsson, Rechtfertigung und Schöpfung in der Theologie Werner Elerts, no. 10 in new series of Arbeiten zur Geschichte und Theologie des Luthertums (Hannover: Lutherisches Verlagshaus, 1994).)) After 1945 he turned increasingly toward his long-projected history of dogma; however, except for the volume on church fellowship and several important essays, this work lay uncompleted at his death, after which Wilhelm Maurer and Elisabeth Bergsträßer edited an additional volume from the materials that he had left. ((Since Werner Elert is of special interest to American readers, we present here his principal writings. The first major work of Werner Elert, written while he was still head of the Old Lutheran seminary in Breslau, appeared in 1921 under the title Der Kampf um das Christentum; this was an investigation and evaluation of recent philosophy and apologetics, mainly of the nineteenth century. In 1924 appeared the first edition of his Die Lehre des Luthertums im Abriß, which was translated and published by Charles M. Jacobs under the title An Outline of Christian Doctrine, 1927; the second German edition, 1926, was greatly revised and enlarged. Elert’s chief work was his two-volume Morphologie des Luthertums, 1931, of which volume 1 was translated by Walter A. Hansen and published by Concordia Publishing House as The Structure of Lutheranism, 1962. The first edition of his dogmatics, Der christliche Glaube, appeared in 1940; parts of this have been published in English by Concordia Publishing House. His Das christliche Ethos followed in 1949 and was translated and published as The Christian Ethos by Carl Schindler, 1957. The last work that he prepared for publication was Abendmahl und Kirchengemeinschaft in der alten Kirche, hauptsächlich des Ostens, 1954, translated by Norman E. Nagel and published by Concordia Publishing House under the title Eucharist and Church Fellowship in the First Four Centuries. This book interprets communio sanctorum in the Apostles’ Creed as a neuter, i.e., as the participation in the sacraments, and it presents a spirited case for closed communion. An important essay by Elert, Gesetz und Evangelium, 1948, was translated and published by Edward H. Schroeder as Law and Gospel, 1967. Posthumously appeared Der Ausgang der altkirchlichen Christologie, 1957, edited by Maurer and Bergsträßer.)) Elert had a revolutionary concept: whereas previous historians had traced the “beginnings” of a dogma, proceeding chronologically from an early date and working downward, Elert proposed starting with the outgoings or conclusion of a churchly dogma, tracing it back toward its beginnings. Thereby Harnack’s speculations that the development of dogma was the hellenization of Christianity could be refuted by showing instead that the completed dogma represented the dehellenisation of Christian doctrine (176–177). Before taking up Althaus, Beyschlag briefly characterizes some other important men on the faculty: the Old Testament scholar and widely-respected Rechor magnificus Friedrich Baumgärtel, the church historian and Luther scholar Hans Preuß, the “high Lutheran” church historian Hermann Sasse, the Reformation scholar Wilhelm Maurer, the multi-faceted historian and Luther scholar Walter von Loewenich, the art historian Fritz Fichtner, and the practical theologian Eduard Steinwand, who was also important for his work in the eastern churches (178–181). In view of the attacks upon Elert and Althaus and the allegations that they supported Hitler and National Socialism, Beyschlag presents an excursus, “The Erlangen faculty and the Kirchenkampf ” (160–170). He specifically deals with their statement on the “Aryan Paragraph” and the “Ansbach Resolution” and shows that the former actually protected Jews and that the latter was leveled against the German Christians as well as the Barmen Declaration. He points out that during the long period in which he was dean of the theological faculty (1935–1943), Elert managed to stave off attempts of a Nazi takeover, that he protected professors and students alike from the state, and that Erlangen remained almost the only “intact” theological faculty under National Socialism. In Appendix 8, Beyschlag reprints Elert’s “Report regarding the deanship of the theological faculty of Erlangen 1935–43” (266–286). He wonders why this Report, which obviously clears Elert’s reputation, was officially suppressed for many years. He points out that, in spite of severe pressure over many years that as theological dean he must join the Nazi party or at least the German Christian Movement, Elert stubbornly refused throughout; that not a single Nazi was able to become a regular professor of theology at Erlangen; that Elert as dean and at considerable personal risk protected 40 or 50 students (including Jews) who had been denounced before the Gestapo (161–162; see also 279). Beyschlag’s book is important for American readers for two reasons. (1) This book is an excellent resource for learning about the confessional Lutheran theology of Erlangen that dominated scholarship in Germany the past 150 years, a subject about which many younger theologians in America are not well informed. (2) Confessional Lutheranism, which has seriously declined since the death of Elert (a decline brought on partly by the dominance of Karl Barth, the Barmen Declaration, and the Union churches, with their attacks upon the Lutheran distinction of law and gospel), receives an important defense in Beyschlag. This book needs to be widely read in America. It is to be hoped that it will be made available in an English translation.